The logic behind the Logitech ZeroTouch is solid: Build a device that will mount almost any Android phone in a car and let it be controlled solely by voice, so that you can get directions, make a call or answer a text without having to touch -- or even look at -- the display. The execution, however, leaves a lot to be desired. There are two versions of the ZeroTouch. 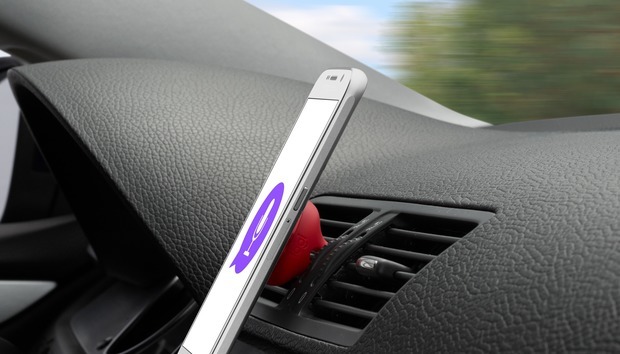 One runs a little under $80 (Amazon price), comes in black and sticks to the top of your dashboard or to your windshield via a suction cup. A second costs about $60 (Amazon price) and is available in black, red or white; you clip it to the slat of an air vent. I reviewed the latter, although they're functionally the same. The air vent mount is a small cylindrical device 1.5 in. in diameter and 1.2 in. deep. It has one flat end and tapers to a duckbill that grabs onto the louvers of an air vent. The flat end of the mount contains a strong magnet; the product package includes a separate metal plate that you can either stick onto the back of your phone or, if you use a case (it has to be reasonably thin), attach to the inside of that case. All in all, this is similar to dozens of other mounts out there. The difference with the ZeroTouch is that the mount has a Bluetooth radio in it that senses when your phone is attached, and starts the ZeroTouch Android app on your phone. (There is currently no iOS app available.) You can set the ZeroTouch to be a Bluetooth Trusted Device, so attaching the phone to the gadget bypasses your lock screen. OF course, Android already has native voice controls, and some vendors -- Motorola being the best of them -- have added extensions that allow you to use a variety of voice control tools. Where the ZeroTouch tries to differentiate itself is by giving you a wider choice of apps you can use. For example, Google's controls limit navigation to Google Maps, but the ZeroTouch also lets you pick Waze or Navigon. Google's voice control steers you to Google Play for music; ZeroTouch lets you use Spotify or Deezer. ZeroTouch also lets you reply to incoming messages on Facebook Messenger, WhatsApp or Google Hangouts (although you can only initiate messages over SMS). You trigger the software by waving at the front of your phone, near the proximity sensor that is usually located near the earpiece. The ZeroTouch app chirps; you can then tell it to call or text someone, play music or navigate to someplace on a list you've already saved. If there there is more than one person or place with that name (or with a similar name), the ZeroTouch app will say the names in question and understand your response. That's the theory. The practice was something else altogether. Cars are difficult and noisy environments, and I found that the ZeroTouch had significant problems understanding me above the road noise beyond the four core commands of Call, Text, Play and Navigate. For example, I told the ZeroTouch to "Call Jeremy." It correctly found the two Jeremys in my phone book and asked which one I wanted to call. But when I told it which to call, the ZeroTouch seemed unable to process the request. Worse, if nothing immediately happened, there was no feedback -- audible or visual -- about whether the device hadn't heard me, didn't understand what I said, or was simply thinking about it. And all too often, the ZeroTouch app would give up entirely and reboot the phone -- not something you want to happen while you're driving, especially if you're getting instructions about where to go. As far as the physical mount is concerned, the ZeroTouch is entirely reliable. Even on rough city roads during construction season, the magnet held the phone fast during my test drives. The software, however, is not fully baked. The idea of a $60 gadget approximating what expensive built-in car systems can do is tempting. But the ZeroTouch programmers need to go back and spend some more time on their app before they declare it ready. Price: Air vent version: $60 (vendor price); $60 (Amazon price). Dashboard version: $80 (vendor price); $78 (Amazon price).